Unionville’s Chris Koehler brings down Great Valley’s Cyree Ames for a big loss, as the Indians overpowered the Patriots, 21-7, Friday night. 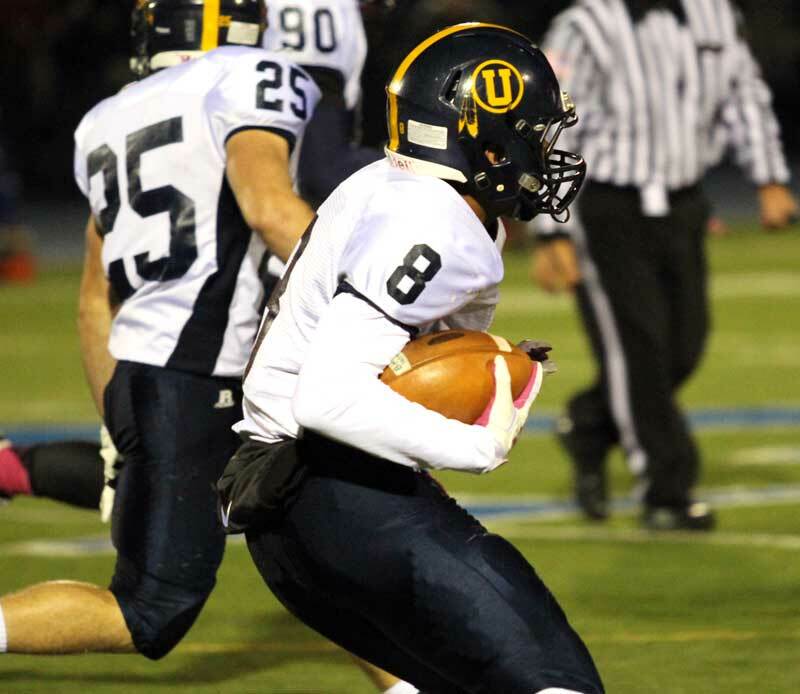 Unionville’s defense was able to largely stop one of the county’s top offenses. Jim Gill photo. MALVERN — As bounce backs, go, this was a pretty significant one. Unionville returned to its ground-pounding roots, riding a stellar game by senior back Garrett Scargill and a dominating performance by the offensive and defensive lines to a powerful 21-7 win over Great Valley, Friday night. The Indians (7-2, 4-1 Ches Mont American) spent much of the night dominating the line of scrimmage, opening big holes for Scargill — who rambled for 177 yards on 25 carries. Overall, Unionville ground out 278 yards on the ground, while only throwing six passes, harkening back to its traditional power running game of previous seasons. On defense, the Indians shut down one of the more explosive offenses in Chester County, keeping the Patriots off the scoreboard until the fourth quarter. 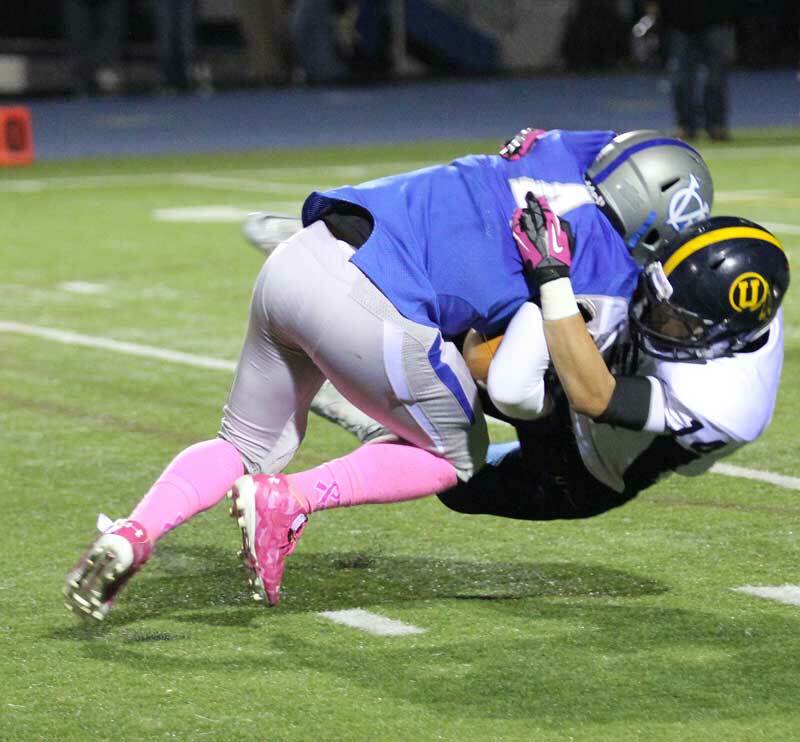 By keeping the ball away from Great Valley, it was the defense that set the tone. Senior running back Garrett Scargill had his best rushing game of the season, powering for 177 yards on 25 carries. Jim Gill photo. Aside from style issues, it was a bounce back from a painful loss last week at the hands of West Chester Rustin (who clinched the Ches Mont American title with a 39-0 win over Kennett) over a Patriots team (6-3, 3-2) that needed the win every bit as much as Unionville — the two teams were tied for the 16th and last slot in playoffs coming into the game. It was also a win that puts the Indians’ postseason fate in their own hands: a win next week against visiting Oxford and they should be a lock for the PIAA District One AAAA playoffs, with a good chance of hosting a game in the opening round. A loss would mean everything would have to break just right for the Indians for them to make the playoffs. The Hornets (7-2, 3-2) are coming off a 56-7 win over Sun Valley and also probably need the win for a District One berth. Unionville’s Elan Nash looks for running room after intercepting a pass. Jim Gill photo. In the early going, Unionville didn’t need to have much break right for them, it dominated during their first two possessions and marched down the field with relative ease, as Scargill kept finding running room right up the middle — and the offensive line had their way with what looked to be a large and skilled Patriots defensive front. And by winning the battle in the trenches, Unionville was able to control the game. The opening Unionville drive was a preview of what the night would bring: good old smash-mouth football. 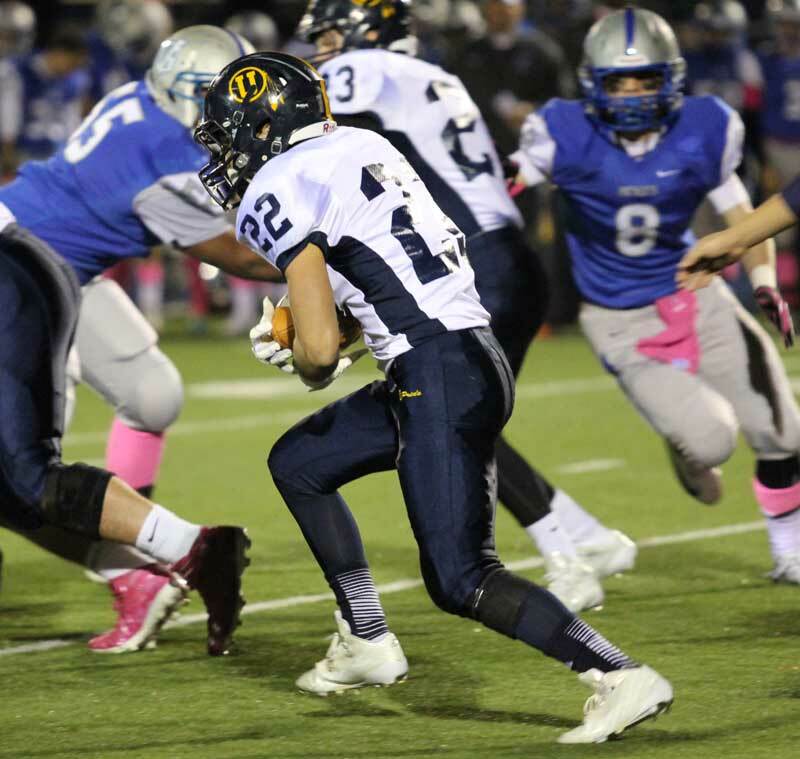 Behind Scargill and Dom DiBiaggio (8 carries, 43 yards), the Indians marched down the field, driving the ball 63 yards, with Scargill pounding the ball in from four-yards out. While last night might have seemed a bit like a coming out party for the senior running back, throughout the season he’s been the team’s top running option — and with the increased use of the passing game this season, a dangerous and dependable receiver out of the backfield. After an impressive Elan Nash interception of a Sean Fitzpatrick pass set up Unionville at the Great Valley 45, once again Scargill, DiBiaggio and the roadgraders up front made quick work of the Patriots’ defense, with quarterback Alex Pechin scoring from 13 yards out after a gorgeous fake sent the defense after Scargill. Although clearly outplaying Great Valley, a Unionville had a couple of turnovers that allowed allowed the Patriots to hang around — keeping the score to just 14-0 to start the final quarter. Things got interesting — or scary, depending on your point of view — for short period of time, when the Indians could not stop senior back Chris Temple on the sweep — and he powered Great Valley on a 74-yard drive to slash lead to 14-7 in the opening seconds of the fourth quarter. After an exchange of turnovers — Pechin threw his second interception on what was an uncharacteristically quiet throwing night, 3-of-6 passing for 31 yards, but Quinn Cheyney recovered a Fitzpatrick fumble — the Indians put the game away with a quick 24-yard drive. Pechin scored from yard out with less than three minutes left.